Microsoft at its much-anticipated "Microsoft Event" in Shanghai launched the all-new Surface Pro 2-in-1. The Redmond giant touts that the new Surface Pro is the company's "most versatile laptop." The new Microsoft Surface Pro will be up for pre-order from Tuesday at a starting price of $799 (roughly Rs. 52,000). Microsoft will be selling the Surface Pro Type Cover with Alcantara fabric separately at $159 (roughly Rs. 10,500) while the regular black Type Covers have been priced at $129 (roughly Rs. 8,500). The next-generation Surface Pen will be sold separately at $99 (roughly Rs. 6,500). Microsoft Surface Pro will start shipping from June 15, and Microsoft says that it will be available in 25 countries. The Surface Pro features a 12.3-inch PixelSense display and supports up to 165-degree hinge. The company at the launch claimed that the Surface Pro's hinge will not break even if bent too far. With up to 165-degree hinge, the Surface Pro can be used in a nearly flat layout. The new Surface Pro runs on Windows 10 Pro and also includes Office 30-day trial. The all-new Surface Pro will come with optional 4G LTE connectivity support. The LTE enabled model of the Surface Pro will be priced slightly higher than regular model. It will support Micro-SIM or eSIM cards. The company hasn't announced the price of the LTE models as of now. The company also introduced the next-generation Surface Pen which will be available alongside the new Surface Pro. The upgraded Surface Pen features 4096 levels of pressure and supports tilt sensitivity as well as 21 milliseconds latency. At the launch, Panos Panay, Corporate VP of Devices at Microsoft, claimed that the new Surface Pro packs about 800 new custom parts. It sports an 8-megapixel rear-facing autofocus camera as well as 5-megapixel front-facing camera. The new Surface Pro is powered by Intel's seventh-generation Kaby Lake processor with a fan-less design. The device will also support Surface Dial, much like the Surface Studio. "With Surface Pro we created a new category and challenged the status quo of the laptop. With every release since we have continued to push boundaries - redefining the ultimate laptop with Surface Book and making the classic laptop feel fresh again with Surface Laptop. 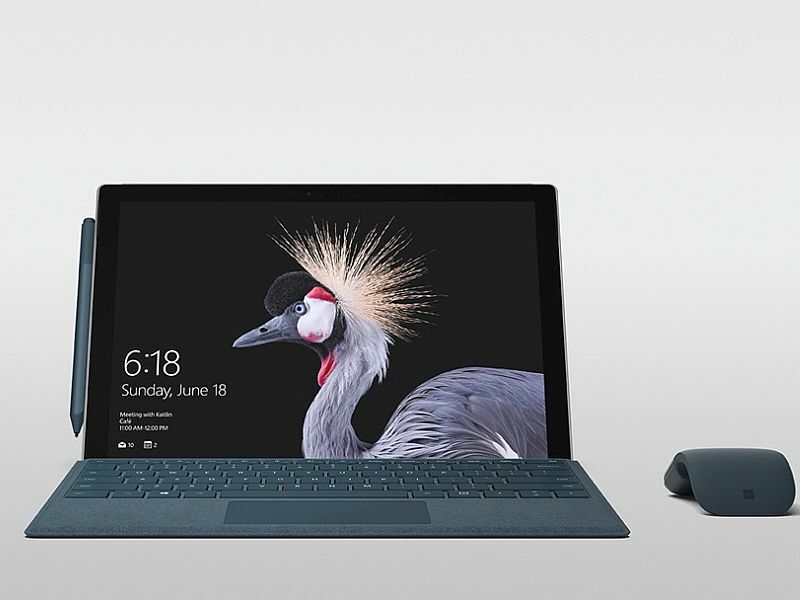 With the introduction of the new Surface Pro we are once again advancing the category by delivering the versatility of a powerhouse laptop and a mobile creative studio in one thin, lightweight device," said Panos Panay, Corporate Vice President, Microsoft Devices.